In just a few hours, Bill Gates beats Jeff Bezos to become the world's richest man again! TechJuice > Startups > In just a few hours, Bill Gates beats Jeff Bezos to become the world’s richest man again! 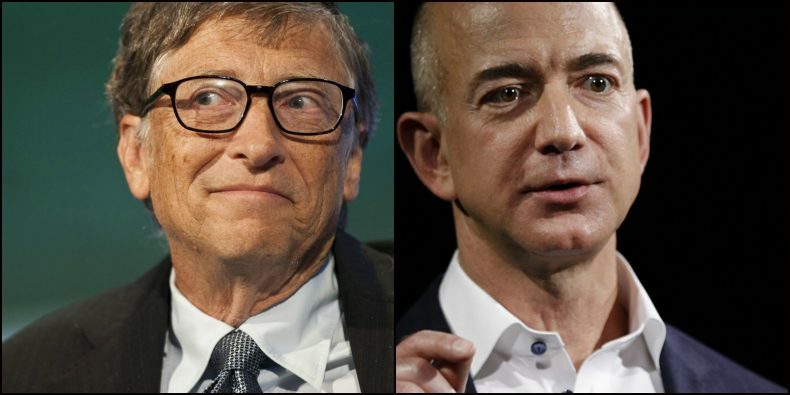 In just a few hours, Bill Gates beats Jeff Bezos to become the world’s richest man again! July 28, 2017 - Like us now! Just a few hours ago, Jeff Bezos was the richest man in the world. Now he’s back to the second spot. When markets opened on Thursday morning Bezos had a net worth of $90.6 billion. Amazon’s stock, of which he holds 17%, had climbed to a high of $1083.31. This led Forbes to crown him as the world’s richest man. However, that only lasted a morning because when the markets closed on Thursday Amazon’s stock fell to $1046 and Bezos’s net worth had dropped to $88.7 billion. So when the day ended, Bill Gates was again the richest man in the world. When the news broke out of Jeff Bezos clinching the top spot from Gates, no body was expecting him to stay there for long. His massive net worth is accredited to his shares in his company Amazon, which made a profit of $197 million sales worth $38 billion in the second quarter of 2017. This shows a fall of 77% compared to the second quarter of 2016 when Amazon made $857 million profits. This is largely due to the fact that Amazon is investing most of its profits in expanding its own business. The company is increasing its workforce and aims to hire 100,000 more people by the middle of next year. And it will also be spending $13.7 billion to buy Whole Foods in order to strengthen Amazon’s standing in the grocery selling business. Bezos probably wouldn’t be anywhere near the richest man in the world had Bill Gates not given large chunks of his money to philanthropic causes. Over his lifetime, Gates has given a little over $30 billion to charity and continues to encourage other billionaires to donate their money via his Giving Pledge which he started with Warren Buffett. Should Amazon’s stocks soar in the future, Jeff Bezos could again overtake Bill Gates in terms of wealth. But for now it is clear that he is the second most richest man in the world.